There are plenty of fitness trackers on the market that will help you track steps, laps, calories burned, or distances but when it comes to finding a tracker for swimming, it takes a little more effort. A swimming fitness tracker has many more features and requires additional metrics. Finding them in a regular fitness tracker, that’s also reliable, can be tough. If swimming is playing a bigger role in your fitness routine, then you may want to consider a waterproof smartwatch. Whether you just need to keep track of laps or you want to log of all of your metrics and stats, the Garmin Swim will accommodate. The Garmin Swim™ is a fitness tracker that aims to help you make the most out of your swim training. Beyond the standard tracking and logging of all your swim stats—lengths, distance, stroke numbers—the Garmin Swim watch will also detect the stroke style you’re using. This gadget is a sleek, black watch with a large, back-lit face that has 6 exterior buttons for eased navigation. As a regular watch, it offers the time in both 12 and 24-hour format and the availability of dual time zones makes this great if you want the option to train when you travel. It also displays the day of the week, date, and has an alarm function. In the box you’ll find a quick start guide and the USB ANT Stick™. This small usb stick will transfer and synchronize the data from your Garmin Swim watch to your computer. Unfortunately, this does mean that syncing to a smartphone isn’t an option and you’ll need a computer in order to access your range of data. The Garmin Swim Watch is also a great choice if you are looking for a sturdy swim tracker that you can also wear as an everyday watch. Features like its automatic stroke tracker and navigation using its 6 exterior buttons make it a solid option if you’re really looking for something that’s easy to use. If you’re interested in having some visually appealing stats displayed right on your wrist however, this might not be the best option. With a screen resolution of only 55×31 pixels, you’ll only see your stats in the form of numbers and they’re not the most attractive digits. You’ll have to wait until you can sync to a computer to get any sort of graphs or charts of your data. While the lack of an attractive, smart display may seem like a drawback, it actually speaks to its true character. It isn’t pretending to be something it’s not and it doesn’t waste effort in the aesthetic. The Garmin Swim Watch is your dependable, no-nonsense option for analyzing and optimizing your swim training. Consider the Forerunner 935 or vivoactive HR if you’re looking for a swim tracker that displays graphs and stats directly on the device. Many fitness trackers, and especially swim trackers, can become so bloated with features and functions that they can easily detract from your workout. Instead of the watch making your swims more efficient and effective, you end up spending too much time fumbling with settings and modes. However, the Garmin Swim watch has a few small but notable features that really help lay its claim to being more utility and less trouble. For starters, unlike many other watches on the market, it uses a watch battery that lasts for about a year. This ensures you’ll never show up ready for a great swim only to find that you forgot to charge your tracker the night before or having to set your workout back while you wait for it to charge. Moreover, its ability to automatically detect your stroke style means one less function to have to set before beginning your swim. You won’t have to waste time pressing the same button cycling through settings because its 6 exterior buttons make navigation quick and efficient. As a dedicated swimming watch, the many stats the Swim records goes well beyond anything a regular waterproof fitness tracker could ever hope to give. Keeping track of laps and time in your head is one thing, but when you want to log your total distance covered, the number of strokes taken, the pace you swim at, or the lengths of your swim you’ll need a tool to help. 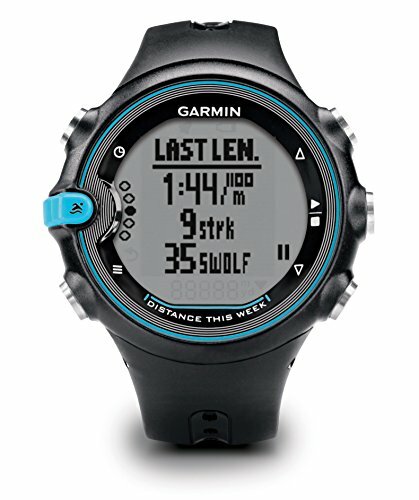 A notable feature of the Garmin Swim watch is its SWOLF calculator. SWOLF, which stands for Swim Golf, is a metric that utilizes the fitness tracker’s accelerometer to give you an efficiency quotient. Your SWOLF score is calculated by measuring the length you swam, the number of strokes it took you to swim that length, and the time it took you. Swimming can be a tough activity and even demoralizing when you only take a look at lap times and see only minor improvements. Cutting your times by a handful of seconds over the course of weeks doesn’t seem all that impressive in terms of improvement. But with the ability to track multiple metrics beyond lap times, this watch gives you many more avenues for improvement. For example, your lap times may not be decreasing at the rate you wish, but maybe you’ll notice an increase in stroke pace. Or maybe you’ll see that on the laps that were slower, your turns weren’t as efficient as they could be. The abundant wealth of data that this gadget gives really lets you see and subsequently tweak your performance where it needs improvement. Additionally, being able to track your stats over the course of weeks and months can help you see a bigger picture in your fitness routine. Performance gains are rarely seen in the day to day, especially in swimming, but having the entirety of your sessions’ data tracked and logged will (hopefully) show you a steady incline. With the additional metrics, such as time of day or temperature, you may begin to notice obscure trends in your routine that give you additional insight into particular performance levels. Maybe you notice that the days that you’re not rushing (early morning swim, lunch break, etc) make for better swims or swimming earlier in the day tends to produce better results than swimming in the evening. Unless you are a professional athlete or part of a team, motivation for swimming can sometimes be hard to find. Moreover, if you’re a beginner, knowing where and how to start can act as a deterrent and keep you from your goals. But Garmin’s fitness tracking app, Garmin Connect gives you access not only to visually appealing graphs and charts of your data, but also provides tips and plans on reaching your next goal. If you’re new to it all, there are plenty of professional training plans available that take the guesswork out of starting a fitness routine. By selecting your current fitness levels and your target goals, Garmin Connect can create calendars and schedules with varying activities and rest periods that can help you reach your target goals. Connect isn’t just for looking at numbers though, there’s also a large community of fitness-minded individuals that you can interact with and maybe even compete against. If you’re the competitive type, you’ll enjoy Garmin Connect. It gives you the ability to see how your friends and the pros are doing in their fitness routines and maybe adjust yours accordingly. We all know we work a little harder when there are other people holding us accountable and this gives you back any motivation you might otherwise lose when working out alone. And if you’re the social butterfly type, you can easily share your progress with Twitter and Facebook, and other social media platforms. Use it to congratulate your friends or let the world know how well your goals are coming along. In terms of benchmarks, swimming can be demoralizing at times and knowing how and where to improve can be tricky. But having an abundance of features and modes can make things even more confusing and downright overwhelming. These issues are both covered by the Garmin Swim Watch. The amount of data provided really lets you devise a plan of action in order to improve not just your swim times but your overall swim form. And it does this all without being excessively clunky or feature-bloated.